Notes: [source DASA ARRIVAL] Sections laid on linen; An extraordinary detailed composition depicting Southern Africa, made from sheets of Lannoy de Bissy's groundbreaking mega-map of Africa. Author: Richard de R?nauld de LANNOY DE BISSY (1844 - 1906). Place and Year: Paris: Service g?graphique de l'arm?, 1897. Technique: Chromolithograph, dissected into 32 sections and mounted on original linen (Very Good, save for a stain in upper right corner), 107 x 85 cm (42.1 x 33.4 inches). Code: 64973 This unusual composition is comprised of sheets from the 1897 edition of Richard de R?nauld de Lannoy de Bissy's famous 63-sheet mega-map of Africa, here depicting much of Southern Africa, including most of modern-day South Africa, Namibia, Botswana, Southern Mozambique, as well as parts of Zimbabwe and Namibia. Unusually, the map composition was custom-made to focus on this critical region, trimming the original sheets to the edge of the map area, so that they could be optically joined to form a large custom map of the region. As the original margins, which featured some peripheral printed details, have been trimmed away, the maker of the present composition has pasted the scale mileage bar to the lower part of the map, so preserving the practical utility of the new composition. 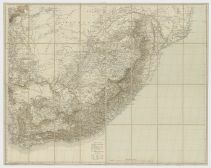 The mapping of the region is highly detailed, predicated on the very best available sources, in this case, largely from British maps of South Africa, Portuguese maps of Mozambique, as well as accounts of exploring expeditions into the deep interior. The coverage of the coastal regions throughout and the inhabited areas of South Africa are very precise, based on advanced scientific surveys, with all cities and major towns labeled, plus the delineation of railways and primary roads. Topographical relief is expressed through shading, and many elevation points are given in metres, plus the map labels numerous geographical features, with the table below translating Afrikaner terms to French. Interestingly, the Kalahari Desert region, in modern Botswana, is still shown to be little understood by Europeans, traversed lightly by the routes of recent exploring expeditions, which are named and dated. The present map composition appeared at a critical time, on the eve of the Second Anglo-Boer War (1899 - 1902), an epic showdown between Britain and the Afrikaners for control of South Africa. This contest was precipitated by the discovery of diamonds, from the late 1860s, along the border of the British Cape Colony and the Afrikaner Orange Free State; and, more importantly, the discovery of the World?s largest ever gold find, the Witwatersrand Vein, in the Transvaal, in 1886. The ensuing political and military drama was a global concern, thus this map, which focused on the area of action, would have been of particular value to contemporary observers. Richard de R?nauld de Lannoy de Bissy (1844 ? 1906) was a French soldier and geographer, a veteran of campaigns in Algeria, who developed a particular fascination for Africa. In 1874, Lannoy de Bissy, in conjunction with the French Service g?graphique de l'arm?, decided to create the largest and most detailed map of Africa ever produced, envisaged to be at a scale of 1:2,000,000 (1 cm = 20 km), comprising 63 sheets, which, if joined, would measure 4.2 x 4 metres! Importantly, this time period marked the lead-up to the ?Scramble for Africa?, an all-out rush by European powers to acquire pieces of the continent, which was recently revealed to possess vast mineral wealth. Moreover, much of Africa?s interior had yet to be explored, let along properly mapped. As groundbreaking information from new exploring expeditions into the interior of Africa were continually arriving in Europe, Lannoy de Bissy went to great efforts in order to obtain the most up-to-date geographic intelligence from various governments, scientific societies and the explorers themselves. The first sheets of Lannoy de Bissy?s Carte de l'Afrique ?l'?helle de 1:2 000 000 were printed in 1880, with others to follow, until the first edition of the entire map was completed by 1888. It was exhibited at the 1889 Paris World?s Fair, where it won great acclaim. Subsequently, as new information continued to arrive, the map sheets were reissued in updated editions, with the present composition being comprised of sheets from the 1897 edition, specifically being Sheets no. 54 (Vryburg); no. 55 (Pretoria); no. 59 (Ville du Cap); and no. 60 (Pietermaritzburg). Lannoy de Bissy?s Carte de l'Afrique was by the far the grandest general map of Africa available during this critical period, and the present custom-made composition details what was, in 1897, perhaps the Continent?s most critical region. References: Cf. Olivier Loiseaux, ?La carte d?Afrique ?1:2 000 000 de R?nauld de Lannoy de Bissy?, in Revue du Comit?fran?is de cartographie, no. 180, (June 2004), pp. 102-16.